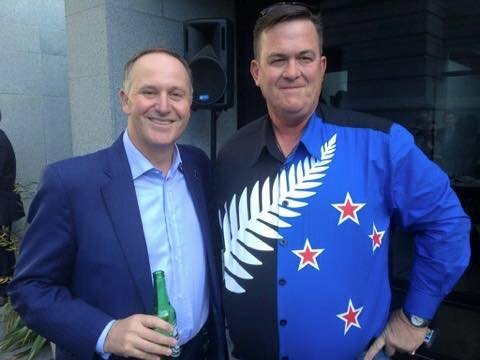 Could Plunket perhaps stop wearing that shirt now? It really is the worst thing. I'd love to see it adopted as an emblem for NZ Music. For NZ On Air, NZMIC and others to band together to license it for use to denote "homegrown" at home and "straight out of Aotearoa" elsewhere. Not exactly a flag or a logo, but a badge of pride. And it would be money very well spent. Also, yes. One for Christmas is a great idea. Getting rid of the Union Jack is the most important thing, and we could argue until the cows come home about what should replace it. This is arse-about-face. Getting rid of the Union Jack becomes important at the point where you've made the Union Jack no longer appropriate to appear on the nation's flag, ie when HRH is no longer the head of state. Until then, wanting rid of the Union Jack is just wanting to pretend something is true when it isn't. Let's do stuff in the proper order. One thing that has concerned me greatly about the result of the referendum is the very low voter turnout in the Maori electorates. I'm aware that Maori turnout is often low but, in this case there seems to be a step down from the general electorates to the Maori electorates. In the 2013 asset sales referendum, turnout in the 7 Maori electorate (and 3 other electorates of Manurewa, Mangere and Manukau East) ranged from 29.9% up to 34.4%. Then next lowest electorate was Botany at 36.9%. I'm not from Auckland so don't really know much about those three other electorates, other than their location. I'm just generalising based on the numbers. This is a full 7.5% jump in turnout to Kelston and 10.4% to Mt Roskill. Or looked at another way, 25% higher turnout in Kelson vs Te Tai Tonga, 35% higher in Mt Roskill. It's even worse when you compare it with Tamaki Makaurau (60% and 72%). Almost all electorates had a higher turnout in the flag referendum than in the asset sales referendum. 16 electorates were lower, and 54 were higher. All 10 of the electorates that I mentioned here (the 7 Maori electorates along with Manurewa, Mangere and Manukau East) were lower. I'm not Maori and don't have a close friendship with any Maori people but this concerns me greatly. Does anyone have any insight into this? If Maori aren't engaged in this referendum process for whatever reason (not enough Maori-inspred options, desire to keep the current flag, general apathy, etc), then in my mind this is yet more evidence of this process has failed. People in those electorates tend to be poorer and I guess might be more concerned with feeding and housing their families than which fleg flies over wealthier people's homes. Priorities. I'd also note that Maori who really want a flag already have a well-used one of their own. That might affect their level of engagement with a Parnell chap's hobbyhorse. Let's do stuff in the proper order. I’d also note that Maori who really want a flag already have a well-used one of their own. That might affect their level of engagement with a Parnell chap’s hobbyhorse. Someone suggested to me on Friday night that Red Peak might now become the white liberals' Tino Rangatiratanga flag. There are some fairly obvious caveats to that, but in the sense of it becoming a popular, unofficial symbol, maybe it's not too far off. Btw, I didn't want to bang on too much about the process in the post itself, but I took part in Newstalk ZB's flag marathon and happened to be on air with Rhys Jones, a member of the flag consideration panel. At one point I asked him what the point of publishing the "longlist" of 40 designs was, when the panel had already closed off on public feedback – and, indeed, basically chosen its four candidates. What was the list meant to be for? He literally could not explain it. What an utter shambles. There must have been some interesting conversations in Xero circles since Rod Drury was on the flag consideration panel itself. Also very interesting about the long list of 40. There were some much better designs in that group but to have 3 fern based designs in the final list felt like a setup. I voted for Red Peak but the way preferences work it was not a surprise to be beaten. If we were to have a new flag I would still prefer something like Tino rangatiratanga but I can also see why the history behind that would be a problem for many. What is good about Red Peak is that references many of the same ideas but in a new way. I was interested to see this entry in an official website. I think that most people will vote against a new flag now – not because they like the old one but because they don't like the new ones. I have Red Peak flying. It is a strong design and looks very good close up and at a distance. I'm going to keep flying it. Colonialism is part of our history. You can investigate and narrate history, but you can't change it. It is what it is. A standalone change to the flag is promoting an alternative narrative (of an "independent" New Zealand) that actually runs counter to the real direction of policy, for colonialism is very much alive in the 21st century. The TPP is giving the US control over much of New Zealand's laws, while overseas, the developed world is reasserting it's "right" to exercise governance over peoples deemed too savage to govern themselves. 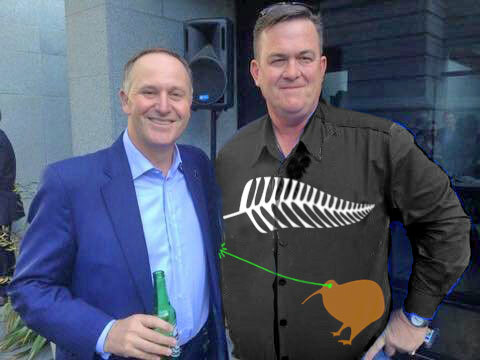 Many people believe the silver fern on black already represents New Zealand. No reason why red peak can’t be an alternative. Personally I have tried to like it (and I voted for it) but there were much better designs submitted, I think, including the charming one above. I’ll be voting to retain the current flag because I want to protest the total lack of designer-input and the pretend public-consultation, not because I have a particular attachment to it. To those who say, “Well that’s democracy, you end up with something charmless and insipid” – I’d like them to explain how the process was democratic. Merely getting to vote doesn’t make democracy. And John Key should not be stating his flag preference all the time. He gets to vote, same as the rest of us, apart from that he should STFU. I'm sure people will be flying laser kiwi, too. Imagine how they'd describe what the Lockwood symbolises ..? The good thing is we now have a chance to do this right. Vote for the current flag and then let's have another crack at this in a few years. While we are at it let's change our name to Aotearoa / New Zealand and perhaps get the people of tomorrow to make the choice, not the elderly and unusually politically involved that vote in postal referendums. The people that will live with any new flag don't even use the post - that is how poorly this was conceived from top to bottom. One last thought: can you imagine changing the national anthem and having no musicians? That is what we did here. I’m sure people will be flying laser kiwi, too. That's better! At least laser kiwi knows it's silly. I'm going to guess that one was supposed to represent Matariki (in red) / Crux (in white), rather than an array of failed attempts to apply bandaids. But hey, as a national symbol, that works too. I voted Red Peak for one very simple reason, and the architect Mies van der Rohe said it best: "less is more". 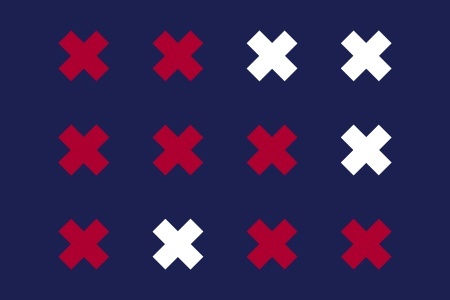 Guess I'll be voting for the existing flag next year, not because I like it but because the winning design shouts out loudly "designed by committee". "I voted for Red Peak but the way preferences work it was not a surprise to be beaten." What on earth is that supposed to mean, Jason? Do you actually understand how the Preferential Vote works? Have you actually had a look at the preliminary result at www.electionresults.org.nz? The reason why Red Peak was unsuccessful, was simply because it did not receive enough votes to win. Even if every vote given for Koru (51,879) and for Silver Fern (Black and White) (77,802) had transferred to Red Peak (119,672), upon their exclusion from the count, Red Peak would still only have received a total of 249,353 votes, well short of the 552,827 first-preference votes received by Silver Fern (Black, White and Blue), not to mention the 574,364 first-preference votes received by Silver Fern (Red, White and Blue). In other words, Red Peak was always going to be the third option to be excluded from the count. Your comment reproduced, above, implies that the vote-counting system worked against Red Peak. Nothing could be further from the truth.